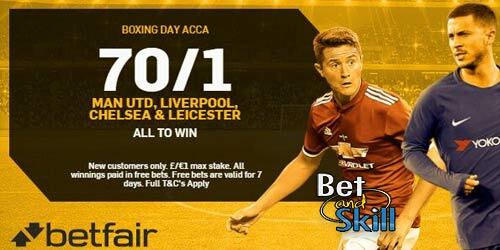 Boxing Day enhanced acca: 70/1 Man UTD, Liverpool, Chelsea and Leicester to win at Betfair! Betfair is offering an enhanced accumulator on Boxing Day! Claim a HUGE 70/1 for Liverpool, Chelsea, Leicester and Man UTD all to win (instead of 7/1). As new customer, you will also rget eceive £100 in free bets! What are you waiting for? What a terrific offer! Betfair will pay 70/1 instead of 7/1 on Boxing Day's Premier League matches! Get 70/1 on Chelsea, Liverpool, Man UTD and Leicester all to win! Stake £1, win £70! Place a bet on Chelsea, Liverpool, Leicester & Man Utd all to win in the 'New Customer' market at the enhanced price on the Sportsbook. Max stake £1. "Boxing Day enhanced acca: 70/1 Man UTD, Liverpool, Chelsea and Leicester to win at Betfair!"